The K860 is the top of the line model in Lenovo's smartphone range and comes with a quad-core Exynos 4412 processor and a 5.0-inch 720p display. The handset has a rather boring design with a slab-like shape devoid of any interesting visual design cues. The build quality, however, is excellent. The 5.0-inch HD display looks pretty impressive, with natural colors and wide viewing angles. It's on par with what we have seen on the Optimus 4X HD, although the One X still has the better LCD in our opinion. Lenovo's software skin on top of Android 4.0.4 seems overdone with superfluous animations and a visual style that will win few beauty pageants. The quad-core does a decent job, however, with satisfactory performance. 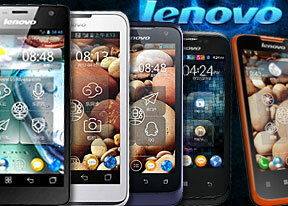 Here's how the Lenovo K860 web browser benchmarks compare to those of its quad-core rivals. Next in line is the Lenovo S880 that has a 5.0-inch, 800 x 480 resolution display. Contrary to what it might sound, the display does not look all that bad and unless you have seen an HD display you should be fine with this display. The design of this phone is much more attractive than that of the K860 and the build quality is just as good but the phone feels unnecessarily bulky, which, coupled with its size makes it feel unwieldy. On the software side, the S880 has similar UI modifications as the K860 but the single-core MTK 6575 isn't nearly as powerful and it shows in the UI, which isn't as smooth or fast as on the K860.